In the days before refrigeration many estates would have an ice well. Generally this would be a brick-lined pit in the ground with a domed roof to control the circulation of air. It was often sited under trees and some way from the house. There would be some form of drainage at the bottom and the ice packed between layers of straw. This would be cut from nearby ponds/lakes or could be bought. Ice for commercial purposes was imported from Norway (1820's - 1921) and America (1840's). The ice well worked in the same way as a vacuum flask by insulating in the cold and excluding the warmth. Ice would then be available throughout the year or maybe last for two years. Because they were tucked away and vegetation was encouraged to grow over them their presence isn't always obvious. At least 2500 ice houses still exist in Britain. Below are some examples in the London area. One of the earliest was built in Greenwich in 1619. In the south of RICHMOND PARK was a keeper's lodge, built in the 17th or early 18th century and later enlarged into a residence. Its ice house was summounted by a summer house called the Thatched House from which the present lodge takes its name. The ice house in MANOR HOUSE GARDENS in Lee is thought to date from c1773. It was built in the NW corner alongside other estate buildings under a landscaped mound of earth. The corridor to the ice house would probably have been used as a cold store. Around 1900 it was used as stabling for a local builder's ponies and served as an air raid shelter in WWII. 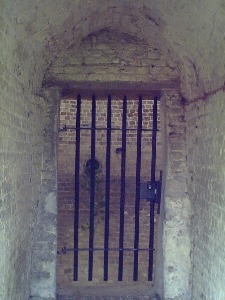 The ice house was restored by Timpson Manley when the gardens received lottery funds to restore its original features. The ice well on the HIGH ELMS ESTATE in Farnborough is on the right of the path leading to the visitor centre (BEECHE). It was cleared and restored in 1975. 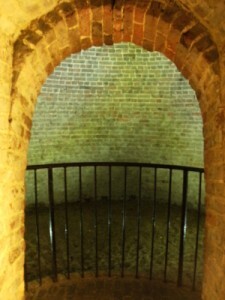 The main well chamber is demi-john shaped and approached by steps and a curving tunnel to avoid the entry of warm air. It is thought to date to c1850 and an unusual 13' high secondary chamer was added later, possibly as a larder. On the surface are two metal covers, one is on the crest of the main well the other may have been to enable a ladder to be passed down into the well. Occasionally open for tours Tel 01689 862815. 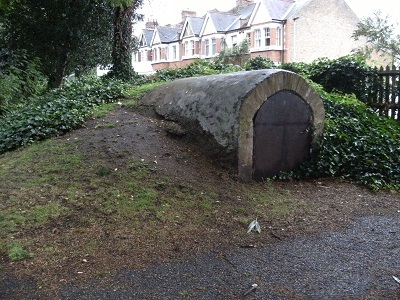 The ice house of GIFFORD HOUSE survives at the top of Putney Park Lane. Gifford House was built in the 1750s, rebuilt c1894 and demolished c1950. The GROVE HOUSE ESTATE is now part of Froebel College at Roehampton University. 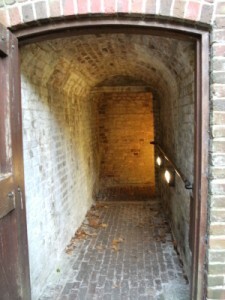 The grounds include a curious man-made grotto within which is an icehouse, similar to that at Ham House (see photo above). The grotto was constructed around 1912 by which time the icehouse had ceased to be used. 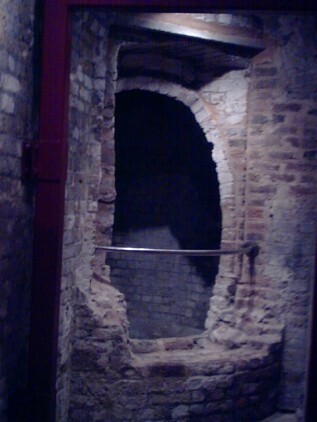 The icehouse was rediscovered in 1998 behind a bricked-up door which was removed along within rocks and rubble inside. KEW GARDENS Ice House is in the Winter Garden, west of the Princess of Wales Conservatory. It was in use in 1763 and had a thick wooden door in the north facing entrance tunnel. Ice was taken from the lake and took 3 days to collect and store. A circle of bricks surrounding a small statue marks the site of the ice house of HURLINGHAM HOUSE. This is now part of the Hurlingham Club on the River Thames at Fulham (no public access). There is an ice house in CRANFORD PARK sited near what would have been the NW corner of the house (demolished). SILVERHILL HOUSE was demolished in the 1950s but part of the grounds remain as a public park accessed from Twickenham Road, Isleworth. The manor of HANWORTH was owned by Henry VII and used as a hunting lodge. The house was destroyed by fire in 1797 and Hanworth Park House was built in the manor grounds in 1820. In the 20th century it was used as a hospital, hotel and retirement home. The ice house is located under a tree-covered mound near the Uxbridge Road/Hounslow Road junction. In 1870 Samuel Sugden, a homeopathic chemist, purchased land in Edmonton and renovated the farmhouse, naming it Oak Lodge. He added a walled garden, orchard and ice well. The Lodge was demolished after WWI and the land purchased by Southgate UDC for the creation of the public OAKWOOD PARK. The top of the ice well can be seen in the north west corner of the park. The ice house on EAST HEATH, Hampstead Heath (located between the toilets and Vale of Health Pond) is an old keeper's hut. It was built for Sir Thomas Maryon Wilson, lord of the Manor of Hampstead, as part of his development of the area. On the KENWOOD ESTATE the dairy had an ice well beneath its central room. This building near the West Lodge is now a private residence but can be viewed from the paths. There are some interior photographs in the Mansion Cottage information centre. Another ice well is situated in the Duellings Grounds but there is no general public access to this. 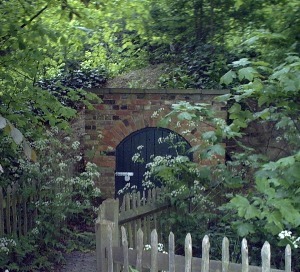 The ice house in DANSON PARK was sited in the Mid Park (just north of the present boathouse). An ice and snow house was made for Charles II in what is now GREEN PARK. These features remained until the early 19th century. A mound in the west of the park marks the spot. A large ice well at 34 Jamestown Road, Camden was probably used to store ice from the nearby Regent's Canal. It was abondoned around 1914 and filled with rubble.